This occurred as the airliner made its climbing maneuvers to achieve an appropriate altitude for a straight and level flight. The time was 11:55 a.m. The Mexican airliner flew some 200 meters form a spherical, seemingly metallic object that changed colors (from aluminum gray to brilliant red). The aircraft was heading east of Mexico City while the object headed south. According to unofficial data, and under excellent meteorological conditions, the UFO was detected visually as it flew at an approximate altitude of 10,000 meters. 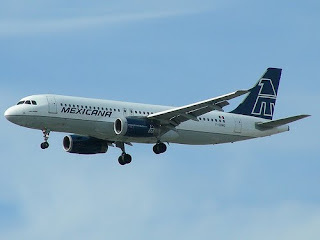 Personnel from MCIA (Mexico City International Airport) had access to the information. It is worth noting that this area, particularly the one near Xochimilco, has become known for its reports of similar objects: metallic spheres that fly over the water, nearly touching the canal's surface.